Are you tired of seeing the same traditional bright yellow poles in front of every store, or worse, your own? These bollard covers are a great way to diversify your storefront display with a vibrant post sleeve while still protecting your business from vehicular mishaps. In most cases, traffic post are easily overlooked and avoided but with an eye-catching bollard cover businesses can transform this static fixture into a promotional beacon. Our sleeves come in either pre-printed fabric designs or customizable coroplast sleeves to diversify any business' advertisement solutions with displays that are outside of the norm. 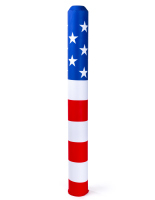 What kinds of bollard covers do we offer? Pre-printed fabric post cover add a splash of color for a quick and simple way to dress-up storefront entrances. 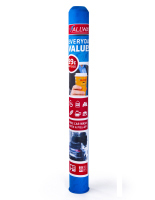 Stretch polyester bollard jackets are simple to slide on and change throughout the seasons or to match promotional material outside of your store. Fabric covers are 98% polyester and 2% spandex, built to withstand the elements. Branded coverings perfectly match business colors or graphics. Opt in to one of our custom options by uploading your company's logo and image to create a focused ad campaign at the front of your store. Welcome your customers with focused advertisement in a place people seldom expect it, a sure way to capture their attention! Good merchandisers are always looking for new ways to grab customer attention inside their store, but great merchandisers already have their attention before they even enter! 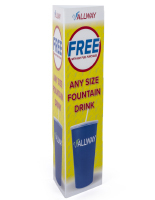 These covers slide over a post in just seconds to create a hassle free display to welcome patrons to any business. Custom printing options allow businesses to adapt our covers to meet the promotional or informational needs of any industry. Whether that be informing customers about a sale before they enter the store, or adding additional reminders to warehouse or wharf employees about their job duties. Post covers are a great way to help your business stand out by advertising in a seldom used place. Use sidewalk poster frames to remind customers of other great deals you offer. Take advantage of write-on boards, fillable poster frames, or even custom printed sidewalk signs for focused storefront displays.